Why did I read this book: I think I fell in lust with this book as soon as I heard its title and laid eyes on its delightfully over-the-top cover. I mean, look at that flaming sword AND machine gun! Then I read the synopsis, saw the word ZOMBIES, and was instantly smitten. 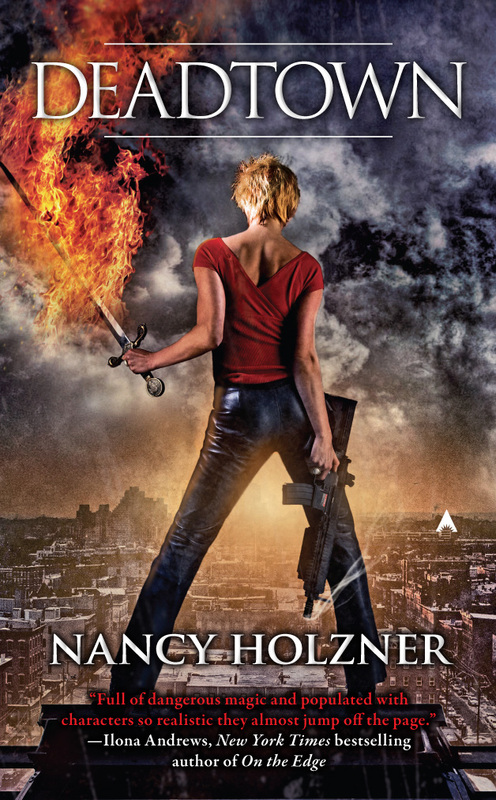 AND when author Nancy Holzner contacted us shortly after we received an ARC from the publisher, we immediately got her to agree to an interview. Victory “Vicky” Vaughn is Boston’s premiere (and only) demon slayer, and she also happens to be a demi-human – a special brand of shapeshifter known as a Cerridorion. Ever since a mysterious plague overtook the downtown part of the city, instantly killing any humans in the vicinity, downtown Boston has become known as “Deadtown” – a quarantined area where all paranormal creatures are required by law to live. Following the outbreak of the plague, the humans that died returned to life as zombies – definitely undead and with insatiable appetites (but for regular food, not necessarily human flesh). The very public existence of zombies also meant other preternatural creatures, like vampires, demons and werewolves, decided to step out of the closet and reveal themselves to the world. While paranormals lack the essential liberties and rights afforded to humans, for demi-humans like Vicky, it also means she can conduct business out in the open. When she’s not helping clients get rid of their demon infestations and keeping Deadtown safe, she juggles a romance with werewolf lawyer and champion for paranormal rights, Alexander Kane. Lately, though, something’s been wrong in Vicky’s line of work – and when the “Goon Squad” (the storm troopers that patrol and are quick to abduct and imprison “the monsters” of Deadtown) pays Vicky a visit and haul her in to Boston Police Headquarters, Vicky knows something sinister is brewing in not only Deadtown, but the entire Boston area. A very specific demon from Vicky’s past, a Hellion known as The Destroyer, is back and it’s killing people. Determined to stop the Hellion once and for all, Vicky agrees to help the police, but this task might prove even too big for Vicky’s ample skills as a deeper plot is revealed – politicians, paranormals, witches and sorcerers all seem to be involved. And Vicky only has a short amount of time to get to the bottom of the mystery, before Boston is torn apart by the Destroyer. I read a lot of Urban Fantasy, and have a few go-to staples. Kim Harrison’s Rachel Morgan books, Patricia Briggs’s Mercy Thompson books, Rachel Caine’s Weather Warden series, and Ilona Andrews’s Kate Daniels books all top the list as THE best female protag-centered UF to beat (at least, in my opinion). And wouldn’t you know it? Nancy Holzner and her awesome heroine Vicky Vaughn sure make a strong case to get added to the essentials list. From the second I saw the ridiculously awesome, over-the-top cover for the book, I had high hopes and Ms. Holzner truly delivers with this incredibly solid debut UF novel. Deadtown is told with an authoritative voice starring a great new heroine, and puts an imaginative spin on the usual paranormal suspects; the plotting and worldbuilding are compelling and undeniably fresh. In short – I absolutely loved Deadtown. As a heroine, Victory Vaughn rocks. First off, the name is fantastic – evocative of sultry bombshell broads from the 1930s and 1940s, in a cool, pulp noir Lauren Bacall kind of way. Vicky is dedicated to her job, she doesn’t take anyone’s crap, but she’s not so insistently tough that she’s abrasive (a failing of many an UF heroine). She also has a pretty cool supernatural ability as a Cerridorion – a shapeshifter that can change shape only three times per month, a descendent of witch-Goddess Ceridwen. As a Cerridorion, Vicky’s powers are inherited and she can only use them so long as she has no children, in a fascinating twist on supernatural ability (Vicky’s sister, Gwen, has given up her shapeshifting abilities for children and stability, and the contrast between these two characters is pretty cool stuff). In terms of secondary characters, Deadtown also shines – Vicky’s sister Gwen is a fascinating counter to Vicky’s more dangerous personality; I also enjoyed Vicky’s vampiric roommate Juliet, and especially loved her sort-of boyfriend, the werewolf and attorney Alexander Kane. And, of course, there’s Tina the teenage zombie – Ms. Holzner’s take on the unfortunately reanimated is both hilarious and a bit sad. Those who died in the mysterious Boston downtown plague have returned from the grave, but have been rejected by their family members (especially after their reanimated bodies start to decay and turn green). Tina, as Vicky’s over-exuberant sidekick, is a delightful comic presence. Deadtown is a debut UF novel that I simply could not get enough of. I absolutely loved this smart, fast Urban Fantasy and highly recommend it to anyone – especially jaded UF readers looking for something fun and new. Two rules I live by: Never admit to being a shapeshifter on a first, second, or third date with a human. And never, ever bring along a zombie apprentice wannabe on a demon kill. Lately, given my lack of a social life and my kinda-sorta relationship with a workaholic werewolf lawyer, Rule Number One hadn’t presented much of a problem. At the moment, it was Rule Number Two that was giving me trouble. Of course, I’d only formulated Rule Number Two about thirty seconds ago, but I intended to uphold it for the rest of my life—assuming that I’d make it out of here and have a rest of my life to live. Rule Number Two was thanks to Tina, who—against my orders—had followed me into my client’s dream. I was here to exterminate a pod of dream-demons, and the last thing I needed was a teenage zombie in a pink miniskirt. Weird didn’t half describe it. We stood in the middle of a huge circus tent, the top stretching up and up until it disappeared somewhere in the stratosphere. Eerie music from an out-of-tune calliope swirled through the air. All around us loomed dozens of crate-sized boxes, painted crayon-bright red, blue, and yellow. Suddenly, a box to my right flipped open. With an earsplitting screech an evil-faced clown sprang out, jack-in-the-box style. I raised my pistol, aimed, and squeezed the trigger. The bronze bullet nailed the demon-clown right between its eyes. It shrieked, bobbing around on its spring, then dissolved into a puff of sulfurous mist. Verdict: Deadtown is one of the strongest starts to a new UF series I have had the pleasure of reading in a long while. Absolutely recommended for old genre fans and new fans like – and I cannot wait for the release of book 2. Ms. Holzner is a talent to watch out for. Wow, that excerpt is fantastic! I love this book already. Also, I’m with you on the cover. Sweet. Awesome review! I received this book for review last week and I finished it in one night! Holzner’s writing style and character development drew me in. How can I not like a book that has a pink skirt wearing zombie? I can’t wait for book 2. I’m glad you liked it! It was pretty good for me in parts, not so much in others. Funny thing though, I don’t get the Hollows rec/similarity. mmm…looking fwd to this one! CJ – Isn’t it a fab start to a book? I love it. I think you’ll love it too Nancy Holzner totally rules, and I cannot wait to see what you think of the book! Danielle – Psst, we’re giving away a copy tomorrow, so stick around! My poor wallet can commiserate, dude! Kmont – Well, I’m glad to hear that you enjoyed it overall too!!! I definitely got a Hollows vibe, but that’s just me! And I defeinitely think Deadtown is strong enough to stand on its own feet – I really think Ms. Holzner has it goin’ on. Angie – ooh, hopefully you’ll get to return to it soon! I think you’ll like it, given your taste in UF 🙂 Can’t wait to see what you think! Veronica F. – I hope you enjoy it as much as I did! Thanks for the review! This one was already on my wishlist. And all your go-to’s are the same as mine so I have great hopes for this one! Here i got my next book. Sigh. I was going to pass on this one (I mean, how many UF series can I follow?) but you make it sound soooo good. And I loved the first chapter. Oh yay! A book set in Boston. I love reading books set in the city I live in for some reason. Totally on the tbr list now. Okay after waiting all this time for release day it has come and gone and still do not have a copy of this book. How sad is that? I love the idea that you have said it is going to compare to books that we have already read by Ilona Andrews and Kim Harrison and now after reading the first chapter excerpt and your glowing review got to get to the store ASAP. Alright, another winner to add to my wishlist! What a great review! I hadn’t heard much about this book, but after reading this I definitely want to read it. Thanks! Hey there good blog site! Male. Fantastic. Astounding. Let me bookmark your internet-site in addition to consider the rss feeds on top of that? Now i’m fulfilled to discover lots of very helpful data here while in the publish, we start to use figure out further associated with that respect, thank you for discussing.